Posted in VORTEX2 News on June 11, 2008 by Susan Cobb. 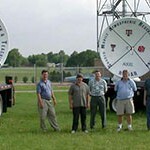 The NSSL and University of Oklahoma Shared Mobile Atmospheric and Teaching Radar (SMART-radar) team was awarded the National Science Foundation Major Research Instrumentation Award to upgrade one of the mobile C-band radars with dual-polarimetric capability. SR-2 will be taken apart during Fall-Winter 2008 and rebuilt with the ability to perform simultaneous transmit/receive dual-polarization measurements.